A collection of artists working in public, live art, engaged, or ephemeral practice. Hosted by Nes Artist Residency in Iceland over 4 bustling months in summer 2013. Marianne Bernstein is an artist, curator, producer and director working from Philadelphia, USA. 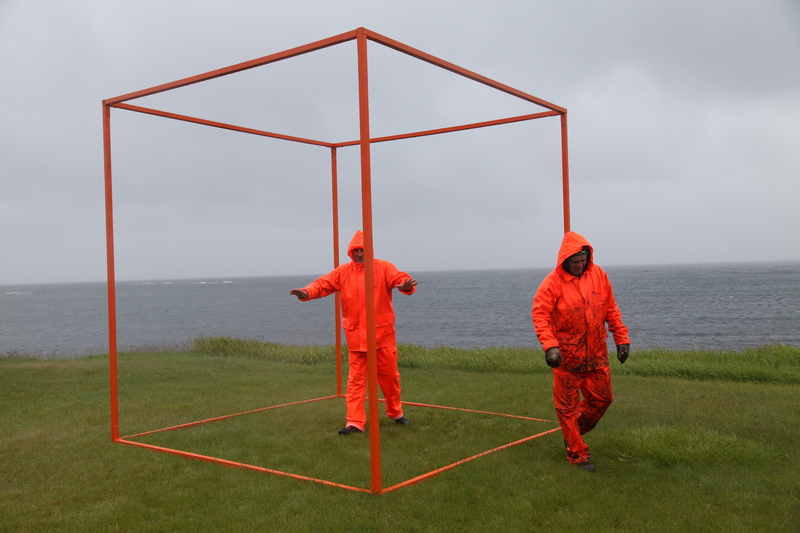 Her work 10 x 10 brought people together with a roaming social sculpture on the streets of Skagaströnd, Iceland. It was portable and moved around the town to contain a view, a perspective, and a space for engagement or portraiture. Bernstein, with the help of 3 local teens, would take a corner and move the cube to various locations. People of Skagaströnd had their portraits taken inside. We saw things differently within the cube. The Cube is part of a larger cross continental, collaborative project Due North which will premier in Philadelphia in 2014.